On the surface just a stately villa in a pretty lake-side outer district of Berlin – but for its significance in the planning of the darkest chapter of history it can hardly be matched. It was here that the "final solution", i.e. the Nazis' industrial murder of the European Jews was co-ordinated. 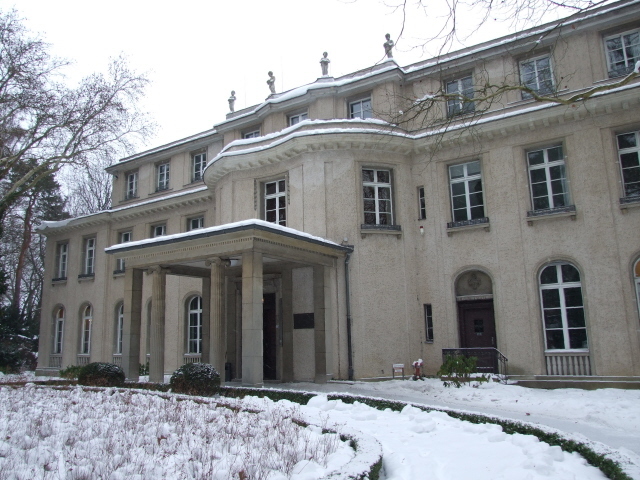 More background info: The so-called Wannsee Conference took place here in this Berlin villa on 20 January 1942 (after having been postponed from an earlier December 1941 date). 'Conference' is actually too big a word – it was more a "business meeting", with just 15 participants, and it only lasted about an hour and a half. But the significance of the subject matter discussed and organized at this meeting could hardly be graver. Often you can read that it was here at this conference that the Nazis decided to eliminate the European Jews. That's not quite correct either. That basic decision had already been taken at a higher level, namely by Hitler himself, and his closest ally in this matter, Heinrich Himmler (see SS). In fact, the systematic murder of Jews had already begun as well, namely in the form of the mass shootings of Jews by the Einsatzgruppen in the newly occupied territories in the East. Only, these mass executions were already being criticized as inefficient and detrimental to the morale of the soldiers as well as to the military plans in general. Himmler himself had apparently come to such a conclusion after witnessing a mass shooting in the East. The purpose of the Wannsee Conference was thus more one of co-ordination and planning of more efficient means to end the "Jewish question" once and for all. The "problem" that the conference was to "solve" was the fact that there were too many Jews to "deal" with, in particular given that the ghettos in the cities especially in Poland were already overcrowded, and diseases were spreading (and threatening to affect areas beyond the ghetto walls). Another problem was that a large proportion of the deported/incarcerated Jews were regarded as "unfit for work" (i.e. unsuitable for useful exploitation through forced labour). It was also envisaged that with the advance of the German armies in the East and the expected eventual victory over all of Europe, millions more Jews would become part of the "problem". The "obvious" solution of sufficient "finality" was the unspeakable … physical annihilation. But even with that accepted, the logistics of such an undertaking were still a tall order. So co-ordination of various elements of the military and state machinery was required. To this end the conference was convened, and a number of representatives from various branches of the state, party and military gathered, invited by Reinhard Heydrich, who also chaired the meeting. Heydrich had already been a key figure in the earlier organization of the Holocaust. As head of the Reich Security Main Office (Reichssicherheitshauptamt) and the Security Service (Sicherheitsdienst) of the SS, he had organized the arrest, deportation and confinement of Jews in ghettos and concentration camps. He also initiated the Einsatzgruppen, who had already begun the systematic murder of Jews in the East, especially the Soviet Union (see e.g. Babi Yar). In mid 1941 Heydrich was then given special authorization (by Herman Göring, officially the second in command in the Nazi dictatorship, after Hitler himself), to see to a "final solution of the Jewish Question". This expression became the crucial code word for the industrialization of the genocide against the Jews, the most sinister phase of the Holocaust. The other participants in the Wannsee Conference were all high-ranking but secondary-level members of either the various relevant government ministries, i.e. civil servants, or of the Military, SS and the Nazi Party leadership. This included legal experts, who were striving to maintain some kind of framework of jurisdiction (however twisted morally). Thus a good deal of the discussion at the conference concerned those aspects, e.g. how far the existing Race Legislation of Nuremberg could be made the basis for the task. Other questions concerned the extension of the term 'Jewish' – some Nazis were keen to detach the label from a purely religious category and make it a wider reaching racial one, also including second and third level mixed race offspring and spouses. Others objected to this. No one at the conference, however, objected to the aim of eliminating the Jews. Only some preferred e.g. the "milder method" of sterilization, so that the Jews would simply "die out" over time. Others saw the existing deportations to ghettos and forced-labour centres as going far enough. But in the end not one of them resisted the given directive that Heydrich conveyed: the Jews had to be "wiped out" altogether. Some conference participants were apparently downright enthusiastic about this – going by the testimony of Adolf Eichmann at his trial in Israel in 1961, who reported that the mass killing of the Jews was quite openly talked about. Even though the wordings in the paperwork were toned down, especially to the usual euphemisms of "solution" and "evacuation". Eichmann, incidentally, was another key participant at the conference. He worked for the Reich Security Service (at that time under Heydrich) and was mainly a "transport expert", having already organized numerous deportations. Later, in Budapest, he would prove especially effective in that capacity. It was also Eichmann who drafted the summary document of the conference – from the minutes, but trimmed down and carefully reworded until his superior Heydrich was happy with it. It's main function was to "nail down" the various ministries and organizations involved to their commitment in the operation. What the document did not spell out was the intended methods of the "final solution" – even though they were discussed at the conference too. The earlier "successes" of the "Aktion T4" (the Nazis' euthanasia programme of, primarily, mentally ill people) were reported, also those made with the prototype gas vans that were pilot "tested" at Chelmno. And so it was "decided" that an equivalent method of gassing would be the most efficient way to achieve the "final solution". In actual fact, that decision had also been more or less in place before the conference ... and apparently even orders for large capacity gas chambers and crematoria had already been placed – but it all had to be approved at this "Civil Servant" level meeting ('Staatssekretärsbesprechung' in German). It's this that generally strikes me as the most incomprehensible aspect of the Holocaust and the Wannsee Conference in particular: precisely this efficiently technocratic callousness of not just the "masterminds" of this industrial mass murder operation but also on the part of the secondary level bureaucrats who knew perfectly well what it was they were doing/assisting. The unofficial code name "Operation Reinhard" to refer to the mass "deportations" to the purpose-built death camp killing factories of Belzec, Sobibor and Treblinka (as well as Auschwitz and Majdanek) is said to derive from the name of the chair of this co-ordinating conference: Reinhard Heydrich. Heydrich did not, however, see the plans turned into reality himself, i.e. he did not live to see their completion – he died in the summer of 1942 from wounds sustained in an assassination attempt on him by Czech resistance fighters in the Protectorate of Bohemia and Moravia, which he was head of. This assassination attempt in turn led to the retaliatory measures by the Nazis against e.g. Lidice. "Operation Reinhard" didn't even take long: the main phase of this industrial mass murder was over by mid-1943, after which all three special death camps were razed to the ground and covered up. In the end only Auschwitz remained as the main large-scale killing centre – and it was here that Jews were mainly deported to from areas that only later fell under full Nazi control, such as, in particular, Hungary (with Eichmann again playing a crucial role). It was only through coincidence that the world even came to know of the Wannsee Conference. It was obviously classified as top secret, the participants couldn't even keep notes. The minutes taken at the conference were not disclosed either, but only served as the basis for Eichmann's summary report of the conference. Only one of the 30 copies of the latter survived the Nazis' frenzy of document burning at the end of WWII as they tried to cover up all traces of their crimes. However, one conference participant, Martin Luther, then Undersecretary of State at the Foreign Office, was later dismissed and imprisoned in Sachsenhausen. His office documents were put in storage at a depot on the outskirts of Berlin, where they survived and were eventually found by the Americans during the preparations for the Nuremberg trials. Luther himself, though, had died at the end of the war, so – like the majority of the conference participants – was never held responsible for his role in it. Another important source of information about the conference, going beyond the carefully worded document by Eichmann, were his own testimonies of nearly 20 years later: Eichmann was captured in Argentina by the Israeli secret service in 1960 and abducted to Israel for trial – predictably, he was subsequently sentenced to death, and was executed in 1962. But the well documented testimonies out of the mouth of one of the main bureaucratic perpetrators of the Holocaust remain amongst the most stunning documents of this gigantic organized crime. Its "target figure", as drawn up by Eichmann at the Wannsee Conference, namely a total of over 11 million Jews to be "dealt with" was ultimately not reached – primarily because the course of the war turned out differently: against the Nazis' fortunes, so that they did not capture all of the Soviet Union's Jews or those in exile e.g. in Great Britain. Given that, it took an astonishingly long time before it was turned into a memorial at all. The villa, built in 1915 and bought up by the Nazis in 1940 to serve as a conference centre and guest house, was after the war first used by the Allied military, then served as an education centre and even as a youth hostel. During the late 1960s a campaign by the Holocaust survivor and historian Joseph Wulf to turn the place into a memorial failed (basically the proposal fell on deaf ears – and Wulf, disillusioned, committed suicide in 1974). Only on the 50th anniversary of the conference in 1992 a first memorial was inaugurated. The present, enlarged permanent exhibition was opened in 2006. What there is to see: From the outside, the house looks innocuous enough: a pretty villa in scenic environs by Berlin's Wannsee lake. It's only on the inside that the building's incomprehensibly sinister secret is revealed: today it houses a substantial exhibition that not just recounts the conference itself but also its wider context. 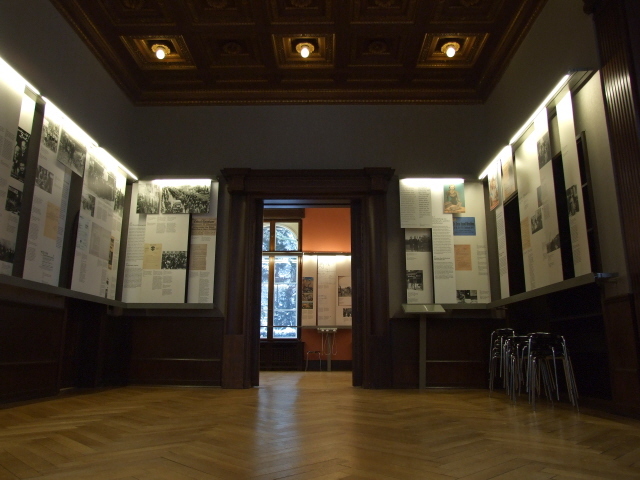 The exhibition extends on both wings of the ground floor, occupying 15 rooms in total, including the one in which the Wannsee Conference took place on 20 January 1942. First, however, the scene is set by the first half of the exhibition in the north wing, which summarizes various thematic aspects leading up to the Conference, such as the origins and rise of anti-Semitism, integration and resurging anti-Semitism in the Weimar Republic, the racist policies of the Nazis between 1933 and 1939, German occupation and genocide during the first few years of WWII in the East, and scope for resistance (as opposed to standing by or even collaborating). This half of the exhibition finishes with the initial preparations for the "final solution", thus serving as a kind of link to the main second half of the exhibition. To lend the exhibition a degree of personalization, as well as an added perspective not just from the perpetrators' view but also that of the victims, four individual survivors' stories are laid out at the beginning of the exhibition. In later sections, these stories are occasionally linked back to, so that a kind of secondary thread is woven through the exhibition. Exposition is mainly through photos, charts, copies of crucial documents, propaganda posters, newspaper cuttings, etc., accompanied by descriptive/explanatory texts that are well balanced, succinct but to the point, without overburdening the visitor with too much detail, too much bulk text to digest. All explanatory texts are in German as well as English, some of the important original documents are also translated into English. The quality of the translations is at a high level – I saw hardly anything that I could find fault with. 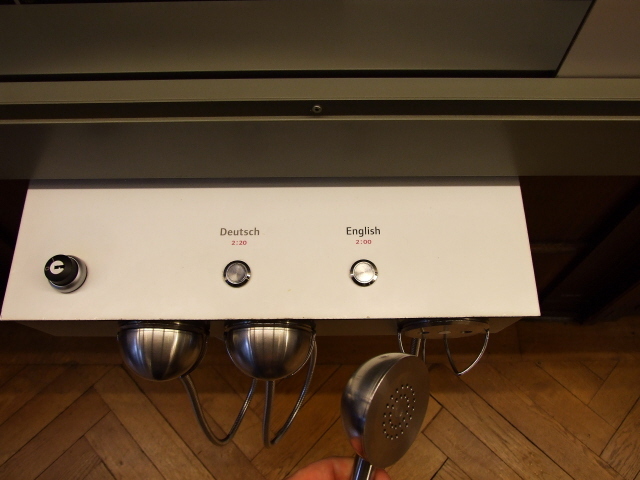 At a few points audio stations are offered: here you can listen to various recorded material, again with a choice of language given (German or English). Thankfully, stools are provided so that you can sit down while you listen to these recordings. 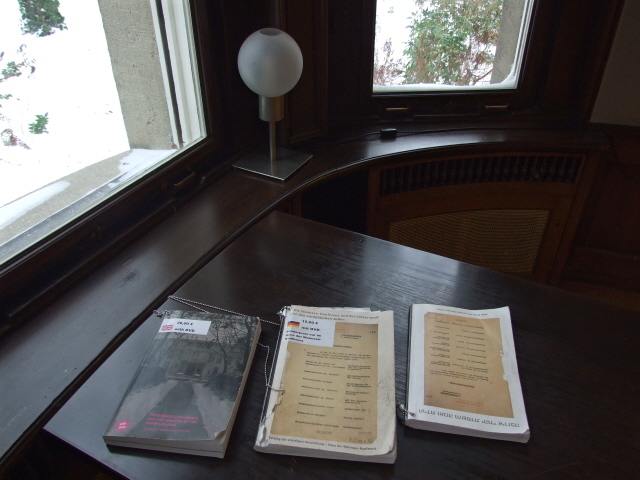 Inspection copies of the exhibition's comprehensive catalogue are put out on a table too (both the German and the English version). By the way: if you ONLY want the information that the exhibition offers, then you could make do with this catalogue – it really covers the entire lot of photos, documents and texts (albeit in smaller size, of course). The substantial website of the memorial (ghwk.de) offers even more (also in a wide range of further languages, though not all of these cover the same amount of information; in some of the less common languages only a brief overview is given). 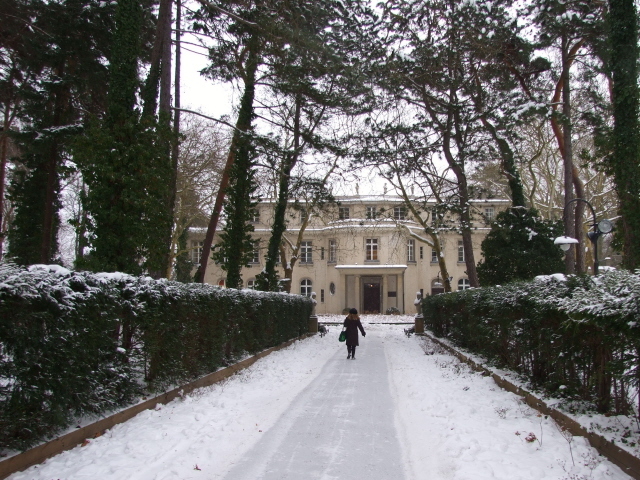 The south wing then moves on to the Wannsee Conference itself. As such this can be regarded as the central section of the whole exhibition – this is it, the place where it actually happened. A first room (the ante-room of the actual meeting room) details the various authorities that the participants represented and their general roles in the Nazi state. The next room, the villa's former dining room, is the place where the actual conference mainly took place. 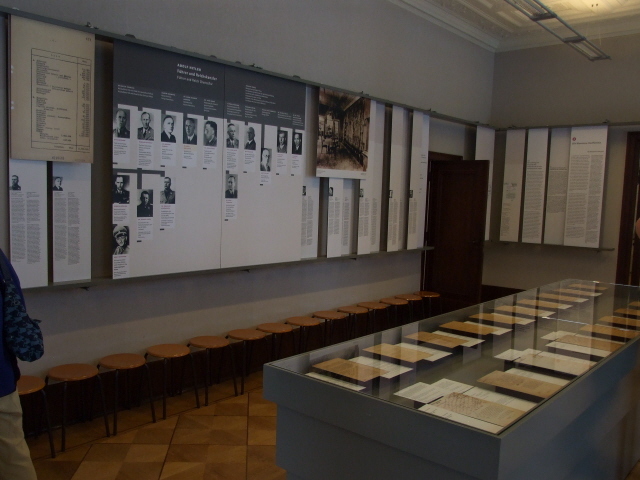 Its centrepiece is a roughly table-like oblong display cabinet in the centre, in which copies of each page of Eichmann's summary document of the minutes of the conference are displayed next to one another. It so happens that the number of pages is identical to the number of participants, so that the pages almost look like place mats for each one of them. You could almost picture them sitting around this table. Along the walls, the individual stories, ranks and roles of the conference participants are outlined. The wintergarden room at the far end of this wing contains more info on the documents' and participants after 1945, including an audio station on which excerpts of the Eichmann testimonies from the trial in Israel are played. The wintergarden room also allows one of the best views from inside the building out to the lake and the park around the villa. 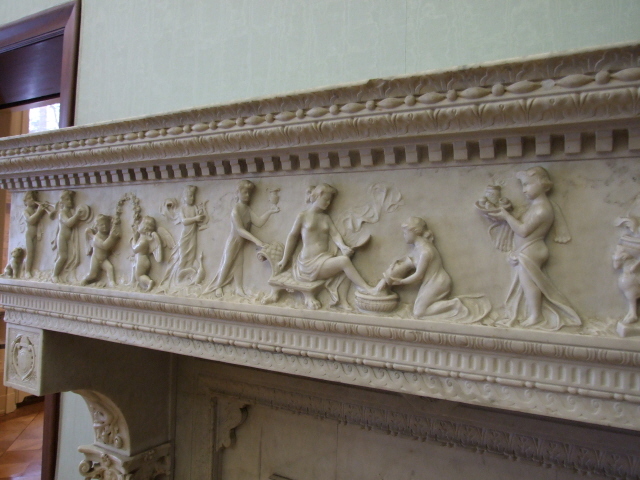 Pseudo-classical reliefs on walls and fireplaces as well as an almost kitsch fountain-like basis in the centre of the room offer a further counterpoint the grave thematic heaviness of the exhibition in a very bizarre way. – also regarding the documentation of the Wannsee Conference in later years up to the present day. Unfortunately I could not inspect these latter parts of the exhibition in detail when I was there – as a school group was given a tour at the same time. But it wasn't so much for lack of space that I couldn't go through these parts at leisure. Rather it was an olfactory factor that prevented this: one of the guys in the group was of the teenage type that had just discovered aftershave, but not yet learned to properly handle it. The intensely biting odour made me gasp for air and rush outside. Never mind – those sections were the ones that thematically I was already most familiar with anyway. Going by the exhibition catalogue, the coverage of these grimmest aspects of the whole story are covered with a decent balance of cold facts and only a restrained degree of graphic images. All in all: a well-designed exhibition, coupled with the authenticity and unique aura of the place, make it a top-notch dark tourism destination within Berlin's already very rich portfolio. A must for the serious dark tourist as well as anyone with a special interest in the full history of the Holocaust anyway. Well worth the long trek out here. Location: out in the furthest south-western corner of Berlin right on the western shores of the eponymous Wannsee lake. Address: No. 56-58, Am Großen Wannsee, in the Berlin district of Steglitz-Zehlendorf. Access and costs: far off the beaten tourist track, but reachable by a long ride on public transport; free. Details: you could hardly go much further from central Berlin without leaving the city's boundaries. It's way out. But: you can take the S1 regional metro train (S-Bahn) to its terminus "Wannsee" (or take a Potsdam-bound line S7, which also goes through this station). Exit the station and cross the street (called Kronprinzessinenweg) and find the bus stop for the line 114. This departs every 20 minutes on a loop route that goes past the House of the Wannsee Conference and even has a dedicated stop "Haus der Wannseekonferenz". The ride takes only about 7 minutes. If you feel up for it, and the weather allows it (it didn't when I was there), you could also walk it: it's about a mile and a half (2½ km) . Opening times: weekdays between 10 a.m. and 6 p.m. – closed at weekends and on major public holidays. Time required: difficult to say, as it will depend on the individual visitor's degree of previous knowledge. Guided group tours are said to last about two hours – which gives you a pretty decent gauge for a reasonably selective visit as an individual too. To go through every detail in the exhibition would probably take the best part of a whole morning or afternoon. Most individual visitors who make it here, however, are unlikely to be total beginners, and so can probably be selective. 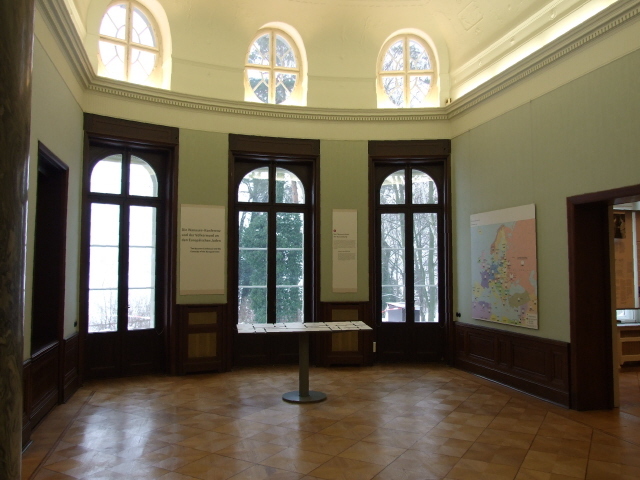 If you only want to see the main central section, the one in the room that the Wannsee Conference took place in, then you could possibly make do with as little as half an hour. But it would be a shame not to honour the well-laid-out other sections of the exhibition too. Combinations with other dark destinations: despite the way-out location on the outskirts of Berlin, there are a few good options for combining the House of the Wannsee Conference with other interesting dark sites. If you take the regional metro train (S-Bahn) line S7 north from Wannsee station, the second stop will be Grunewald, where the platform 17 monument commemorates the deportation of Berlin's Jews – so it's a fitting addition. Related to this is yet another site reasonably well accessible from Wannsee – the Allied Museum in Dahlem. To get there take the S1 regional metro train from Wannsee station to Zehlendorf and from there bus 115 (northbound, 8 stops) to the dedicated stop "Alliiertenmuseum". Near the House of the Wannsee Conference there is a hospital complex, which holds another relic from Nazi times: a bunker that used to be a command centre, and after WWII an emergency hospital bunker (in the Cold War). At one point the "Berlin Underworlds" offered guided tours here, but at the moment they do not appear to be available any longer. For other dark destinations in the city see generally under Berlin. Combinations with non-dark destinations: The area around the House of the Wannsee Conference is an especially pleasant retreat from Berlin's busy and hectic inner city – that's why it was chosen as a conference centre and guest house back then. You can walk along the shores of the lake – especially west and south, past the Pfaueninsel, and even as far as Glienicke on the border to Potsdam. Only a short walk south from the House of the Wannsee Conference, another villa houses a good selection of the works of the artist Max Liebermann in his former summer house, also right by the lake. Liebermann, by the way, was of Jewish origin, so during the early Nazi era he was ostracized and spent the last two years of his life, until his death in 1935, isolated, deprived of his previous fame and positions, and in bitterness. There are plenty of other stately villas in the area, but an even larger proportion of the area is given over entirely to recreation. Most of the lake's shoreline is parkland. And in season, there are also pleasure boat trips cruising on Berlin's many lakes, including Wannsee. Otherwise, for Berlin's premier mainstream tourist sights, you need to head back into the city centre.